In this Chapter, we will look at the act of writing itself. By the end you will know some habits to keep and pitfalls to avoid. The second part of this chapter focuses on style and details how writing in a particular way can help the GM and players pick it up. The first rule of writing an RPG is to keep writing. Do not edit until you have a full first draft of the game. The first draft will be poor but you need to have a complete game before a proper edit can occur. If you get stuck on an area, make a note in the document (I use a load of Xs like 'XXXXXXXXXX' to make it easier to pick the notes out) and move on. Writing a roleplaying game is a little like writing a novel, some of the ideas included here are applied to both and you can plunder novel writing resources if you get stuck. Any large project requires dedication to complete. Initially, you will have a fire and passion of enthusiasm, which will last about one third into the project. If you manage to force through that barrier, the next drop in enthusiasm comes at two third through. If you can get through those then the chance of you completing is extremely high. Here are some habits and tips to help you push through those barriers. Set a deadline to have a 'test' version of the document. Stick to it. Produce whatever you can by that date. Whatever you have at that date, release it to the community - even if it is far from finished. Schedule small releases to the free RPG community. Release small, release often. Collect feedback from the community but don't edit your game right away - wait until it is finished. Don't re-read the game until it is finished. Set aside a time each day or week when you sit down to write. Do write outside of this time but never miss it. Use a calendar to set a regular appointment with a reminder to send you an email/text/tweet. If you have control over the computer you're writing on, set up a new user account that does not have access to games and puts parental filters on games/RPG forums sites to reduce the distraction. Use whatever time you have, great progress can be made even in a half-and-hour lunch break or while the newborn baby is sleeping. Schedule what TV programs you are going to watch and watch only those. Never channel-hop. Open a dialogue with friends and family (non-gamers too) about what you are trying to achieve. By talking about the game, you will find it easier to keep motivated. They might also enquire how it is going and that acts as a softly softly pep talk. Show them the work you have put in. Write the game in any order. Later in this guide, you will learn about ways to organise your game. Organise it last, write it first. [Optional] Play appropriate music to the genre you're writing in for inspiration. Soundtracks to films that inspire your genre are useful. When you feel like you’re flagging, print out an attractive chunk of your game (like a picture you found) and put it on the wall next to where you create. Write these best practise tips on post-it notes and stick them near the place where you write. Never delete text forever - when cutting a section, copy into a 'scraps' document, label it and leave it for later (I do this with graphics too). Do an off-site backup your work weekly. Either upload to a free file storage (such as Google Docs) or put on an old USB thumb drive and hand to a friend or put it in your desk at work/locker at college. If you are stuck finding a name for something, use Thesaurus.com to help find similar words. Mash similar words together. If writing starts to slow, move onto the next section. A good example is essential to making your game playable. Examples should be both compound and independent. Compound examples are where one example leads on from a previous example, for example, if you describe an example character John Smith with a Strength of 9 in one example, John Smith should have a strength of 9 in all examples thereafter. Independent examples do not rely upon previous examples to be understood. A single example should be enough to demonstrate a ruling. Remember that the GM uses the book as a reference, so lean towards independent examples or repeat the important parts of John Smith. A good example takes a small part of the rules and demonstrates it. Larger examples can build upon the simple, atomic examples but be sure to include both. Atomic examples are good for reference, longer examples are better when the book is read through at first. Chgowiz Clone 4123 wants to shoot at Godzilla with a Turbo-Mega-Cannon. His Brawn attribute is 5 and his Guns skill is 5, giving him 10 (Attribute + Skill). The shot is normal difficulty so he needs 12 to pass. There are only 2 dice in the pool in the middle and shooting will burn one of those. The player knows that although shooting Godzilla would hurt it, one of the other players is going to try and ram Godzilla with a tank next turn and will probably need all the dice he can get to pass it! Instead, Chgowiz Clone 4123 decide to choose to fail. The other players decide that the shot misses and blows a chunk of the Post Office away, removing cover for another Clone character. Oops! The GM awards another die into the middle for comedy of it all. There are now 3 dice in the middle and the tank driving Clone is much more likely to hit! Actual play examples can be useful but be careful to keep them curt and to the point - you do not have to write precisely how people speak. If you have particularly tricky parts to your system, include more than one example. It is unlikely that your audience will be completely new to roleplay. Optional rules are fine, mark them clearly as such. Avoid an overly chatty style of writing, it adds words and does not help the reader. Strike a balance between being interesting to read and being informative. Check the example below. Justifications of why a rule is prefered over another belongs on a website. Describe your game objectively and compare it to others only if you are extending the rules or using it as a basis. It is OK to say "Using Fudge rules but with more dice rolling" but not "It's like D&D but lighter and more fun". Avoid elaborating in too much detail on a part of the system which is not core to the concept. Do not add anything to the RPG that is not going to enhance the concept. If you have an idea for a tangent, write it in a notebook and use it later. Avoid including your design process, that is best left on the website or internet forum. Chgowiz uses a completely new and brilliant system where the players share a bunch of dice in the middle of the table. It's so much better than all other roleplaying games because there is normally no penalty to just rolling a skill as many times as you like, here you use up a shared dice when you do it. Sure, fewer dice are rolled but then it means more when they are. I chose this rule to force people to work together, which works really well. The GM puts more dice in when the players have good ideas or do cool things or have fun but you can ignore than if you want. It's up to, it's your game. Chgowiz uses a shard pool of dice in the middle of the table. When the game starts, 2 for every player are put into the middle. When a player wants to do an action, they must roll a dice from the centre of the table. This dice is 'burnt' and handed back to the GM. When the players do something fun, clever or choose to fail an action, the GM awards them by putting dice back into the middle. When the dice run out, all actions fail until the GM puts more back in. I am frighteningly verbose (you've probably noticed in other posts) almost to the point of being lost in a paragraph of text and completely forgetting what it was I was trying to say in the first place. The style tends to lean toward the scientific, which is OK for Icar but didn't feel right for Chgowiz. 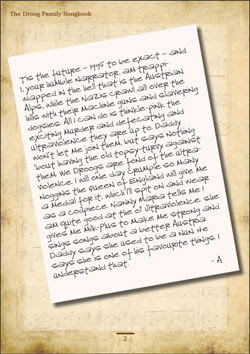 I lightened the tone by writing quotes and paragraph-long stories in callout boxes for flavour. The rules could remain clean of chatty text while lightening it for those reading through. I have also had time issues recently, given changes in job (for the worse then for the better) and being the father of a toddler who likes to play with parents. Also Minecraft has consumed my soul. In a nice way. I am getting back my routine that involves writing for an hour once my son is in bed. Rather than write straight into InDesign (which is how I wrote Cloudship Atlantis, Commando and Icar), I used Google Docs, as a simple text editor. This way there are no distractions by messing around with graphics or layout. Research is the act of gathering information to strengthen your game. If approached with gusto and the right mindset, research can be very enjoyable. By the end of this chapter, you will know how to research, what to research and when to stop. It is important to set a limit on the amount of time you spend researching. By capping the amount of research you do, you will limit the scope of information you have to sift through. Do not set a cap on quantity as it is quality that matters. Set one of the following caps. By date. Set a date and be finished by then. By duration. Set a number of hours and stick to it. The method I prefer to use (both for RPGs and academically) has three steps: Grab, Sort and Filter. Repeat this process until you run out of your self-allotted time. You run round grabbing whatever you see that is appropriate. This requires a lot of Googling (see Where to Research) followed by pasting into a note taking tool. Good tools I've used are Google Docs, Evernote and your notebook. Don't worry about tagging, organising or even reading your information in depth. Just collect it: text, images, quotes, search terms, links, YouTube videos - anything! Core. Information that you know you will need. Inspiration. For those items that just light your mind up but does not have an obvious application. Off Topic. Some of the things you grabbed might turn out to be not useful. Don't throw them away because you might need them for another game. For each of the categories you sorted, order them in importance. The very top item should be absolutely key to your game. Be ruthless in your filtering, too much information is overwhelming. Get to the nub of what your game is about. Research is best performed in those areas where you are going to diverge from what you already know. For example, if you know what roleplaying system you are going to use then do not research lots of roleplaying mechanics. If you are creating your own diceless system or you do not know what system to use then it is worth researching those areas. It is comforting to read research that is familiar but that comforting feeling normally means you are wasting time cementing what you already know. For each of the main themes of your game, find five relevant web pages. Try finding a YouTube video that represents part of your game concept. Read around inside the genre of your setting. For example, if its Fantasy, read something other than Tolkein. Find an existing game that is the closest match for your concept. What does it do well? What does it do badly? Is your concept different enough to be worthwhile? If your ideas are based around a new System, try and find an existing system that has the same benefits or drawbacks. Read a few other free RPGs that are similar to yours. Take notes on how they are organised and how they describe complex things. Do they do it well or poorly? You can find lists of free RPGs in either my free directory or the venerable John H. Kim's Free RPGs on the Web. Read those free RPGs that people are always recommending (Risus, Sketch, Fudge, Fate, Dungeonslayers, Five By Five, Lady Blackbird, Warrior Rogue and Mage). What makes them good? Why do people like them? What can you do in a similar way? Read a few reviews of Free RPGs (from this blog or elsewhere) and check out the common themes. Most of the common problems I have found will be listed in the course of this guide but other reviewers come up with excellent points too. Collect a bunch of images (or deviantArt or Flickr) that help you define the feel of your game. These are not images you necessarily use in the final game (so can be copyrighted images you find at random) but will be useful for inspiration. Ask on forums about the concept, do people think it is a good idea? Perhaps someone may know that it has been done before. The best research is from the source. If you are creating about a place, go there. If it is media (Books, TV, film) then consume that media. The local library and Wikipedia are also useful but beware that these sources can be third hand. If you are writing a game about the world in which we live, try and find an expert in the precise area - for example you might want to ask a grandparent about life in the 1950s. Google can also be a wealth of information. Google Streetview can help you describe a place in the modern world (if you cannot go there) and Google Maps can be used for inspiration. Be careful not to copy copyrighted material. Google Images can be used to help inspiration by typing in keywords associated with your concept. For research, I gave myself just two evenings (about 4 hours). Below is the end result of my grab, sort and filter. I have grouped them by some of the What to Research topics and have left out things that are Off Topic. The Paranoia RPG did cloning well but I want death to be more of a pain in the rump. I also want each clone to be slightly different to the last one. This means that when you die, you might end up with a clone that isn't as good as the last one. I could add a little mutation in with each Chgowiz, giving every character a unique trait. I don't want them to be mutants, though - that's too far. Perhaps a stat boost or different special power. My ideas are based around a new system (for the purpose of the guide). The action/combat system will use a similar system to Cloudship Atlantis, which has a bunch of dice all the players share. The benefit is that players have to work together and sometimes choose to fail. The drawbacks is that if the players are tired and not getting into the game, they will find it difficult to generate more dice. The city will need to be created in a joint story-games way. The monster will be randomly rolled like in Elliot 'Kumakami' Brown's wonderful Feast of Goblins. Here's my thread on 1KM1KT. Do not try and write a roleplaying game without a strong concept. You may produce something but you will find that it will be indistinguishable from other games. Before you write anything down, you need an idea. From this seed, you will construct a concept and that will guide everything you write. The idea need only be a single word or short phrase. We will flesh it out later. If you have an idea, write it down in pencil in the middle of a piece of paper. We will use this phrase as the name of the game for now. My idea is the Chgowiz RPG, first introduced in my Guide to Organising an RPG. Although it's an idea I've already had, I will still go through the process to bottom it out. If you do not have an idea but know you want to make an RPG about something, here is how you come up with that seed. Take two things you like and mash them together. For example, The A-Team meets 2001: A Space Odyssey. Take a thing you like and invert something important about it. For example, The Terminator universe where an archaelogical dig turns up proof that it was the Terminators that made the humans. Open a dictionary at a random page and take the first word. Do this five times and write a roleplaying game about that. Check out the list of insanity on the 1KM1KT forum/. Ask for ideas on a forum. Read outside of RPG blogs, such as Boing Boing, Strange Maps or your favourite news broadcaster. Open a text editor. Start writing. Write whatever comes into your head and don't stop for 3 minutes. It can be anything at all. Do not think while you are writing, just let it straight from the brain. Don't worry about proper sentances either. Write a 500 word story set in a very specific time and place. Make sure you have a beginning, middle and end. Then build your game to represent that world. Create a new game by fixing things you do not like about other games. Grab a local newspaper, find something mundane on page 5. What would it take to make that extraordinary? Write a game about the world if that was to happen. I like RPG _________ but ____________ annoys me. I will do _____________ to fix that. I wish there was an RPG that encourages _______________ type of behaviour. I wish there was a game that used _______________. Write down at least four major themes associated with your idea. These should be themes of a genre, such as: magic, space travel, evil empire, gods walking about, corporations, psyonics, zombies, non-human races. Write each of these themes around your central idea and draw lines from the central idea to each theme. Avoid using the broad genres themselves (Fantasy, Sci Fi etc) as themes. For each of these themes, write down at least four components of them. Two should support the theme, two should be detrimental. For example, if your theme is magic, your supporting components might be 'easy to do', 'powerful' and the detrimental components might be 'illegal', 'dangerous'. Put a + sign in a circle by the supporting components and - sign in a circle by the detrimental components. By having both supporting and detrimental components, this will create conflict and provide you with the seeds of a balanced setting. Answer each of the following questions. Do not proceed until you know all the answers. What will the players do? What is fun about it? Why am I designing it? What do I want to do with it? Are you going to publish it in print on demand? Is it suitable for Campaigns or One-Shots? What's its closest rival and how is it different? The players will be killing giant mutant monsters by working out their weakness and using cool toys. The characters might die quite often but that won't be a big problem as there are loads of clones. Each monster has different weakness that will need to be discovered. Killing things is fun. Using cool toys is fun. The monsters will be smashing up the players' home town. Why am I designing it? Am I going to play it? I am designing it for an example. I am going to try and play it. Male teens to 30 somethings. Upload it to 1KM1KT and spread it around the net. Not interested in publishing a hard cover. I am not entirely sure, I think Mutants and Masterminds comes close, as does Mutant Chronicles. What style of game will it be? It is not important to tie down exactly the style of play the game will engender but it will help you decide whether or not to include something later one. On each of the graphs below, put a spot where you would like your game to be. 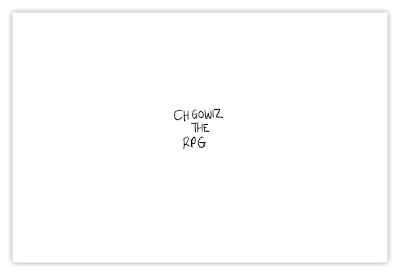 Here is what I chose for the Chgowiz RPG, roll over the graphics to see my thoughts behind each one. Describe your game in 5 words. Elevator pitch, describe your game verbally in 12 seconds. Keep trying until you can. Create a marketing blurb that you might read on a post. No more than 25 words, no less than 12. Draw an advert for your game on a bit of paper. 1. Describe your game in 5 words. 2. Elevator pitch, describe your game verbally in 12 seconds. Keep trying until you can. 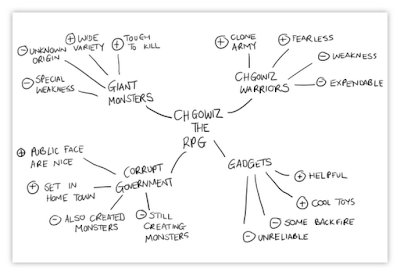 In Chgowiz The RPG, you play cloned super soldiers tasked with taking down giant monsters who are wrecking your town. 3. Create a marketing blurb that you might read on a post. No more than 25 words, no less than 12. They are clone soldiers. They have the toys. They have the target. Can they stop the giant monsters from trashing your town? Now pitch it to your roleplaying group. Is it the sort of game they would like to play? Is the premise fatally flawed? Your friends will provide you with an important grounding. Can you imagine playing this game? If you can, you're a long way towards an idea that will work. Is the idea exciting to you? If it isn't then it will come across in your writing. You should now have a good idea of what your game is about and so it is time to write your Concept. Your Concept is a statement about what the game is going to achieve and how it might achieve it. Write down in no less than 200 words what your game is about, incorporating all the elements in this chapter. 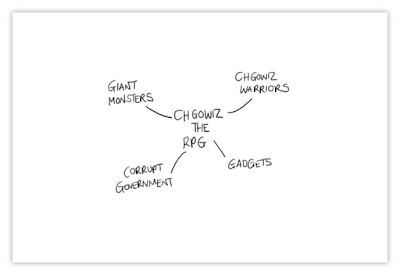 Chgowiz The RPG is a roleplaying game set in the near future where a corrupt government keep accidentally unleashing giant monsters onto the general populace. The players play a fearless army of Chgowiz Soldier clones who must destroy the monsters by finding their weaknesses and using cool toys to bring them down. The core system is lite but with lots of options, which adds a fair amount of crunch. 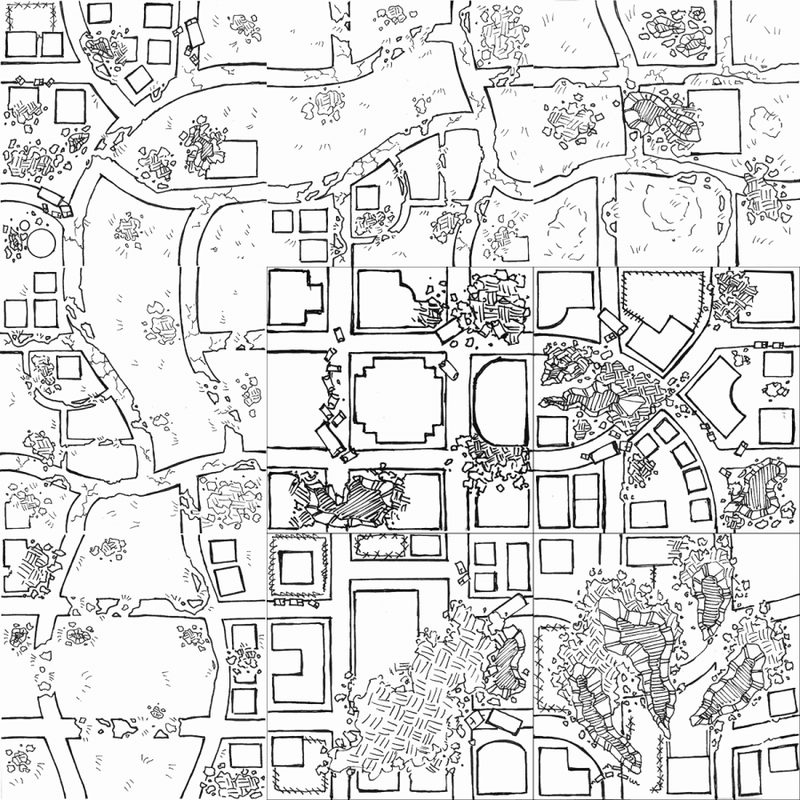 The players are invited to describe their home town with a simple map for the monster to destroy. In this series of posts, you will learn how to create free pencil and a paper RPG from scratch. It covers Inspiration, Research, Writing, System, Setting, Organisation, Testing and Publication. This guide might be useful for commercial games but it is really intended for the hobbyist who has an idea in their heads and needs to flush it out before the therapy bill sky-rockets. The guide is arranged in steps, each step split into instructions and example. In the example, I will be building an RPG as I go. Each step has work for you to join in to. Please do not be upset by the authoritarian language I use. At no point in the future will masked FRPGB Police smash down your door with a printed copy of the monolithic Fear RPG if you fail to comply. I use curt language so that skim-readers can get benefit too. To design a free roleplaying game, you will need the following tools. Have you ever played a roleplaying game? Then you possess ample qualifications for writing one. There is a roleplaying game in each and every person who has played one. If you have the will and an idea then this guide will show you how. Creating an RPG demands perspiration and perseverance. It is daunting to think about the end result: a book packed full of rules and ideas that can be used by a group of roleplayers to entertain themselves for many sessions of play. Scared? That's OK. Being terrified is normal. Instead of worrying about the end result, expect the anxiety and lunch on the fear. You're not the first to feel this way, you won't be the last. Do not give up. Not unless I say so. When you feel yourself flagging, go to your favourite community and post up your entry. If you're not in a community, get into one. Try 1000 Monkeys, 1000 Typewriters (1KM1KT), it is a community for writers of free RPGs, just like you. Do not plan to wait for the finished game but release often and in small increments. It is much easier to keep up motivation if others are following your progress and giving you support. The common tool for all writers is a notebook. Keep one with you at all times. Although I have a powerful smartphone/laptop/desktop/digital device, it is much easier to scribble down an idea - perhaps with a picture - on paper. Moleskines are globally recognised as the standard but a notebook is a personal item and should be easy to carry everywhere. Find one that fits your pocket. Have a pen handy too. I am creating a game as an example of the techniques I've described in this series. It will only be a simple affair for the purpose of demonstration. I've decide to create The Chgowiz RPG that I suggested in my previous guide. Chgowiz is sadly no longer blogging but as a gesture of thanks, I'm going to write the game anyway. Where you see the little icon on the left, it's an example from the game. The Chgowiz RPG is not finished yet - hopefully it will be by the time this blog series completes. Challenged? Need a challenge? How about NaGa DeMon? Friend, philanthropist, 24 Hour Movie Mashup contest winner, fellow blogger and all round nice chap Nathan Russell likes a challenge. He also like to challenge others. Each year, the brave Ozzie co-ordinates the NaGa DeMon - National Game Design Month. Inspired by NaNoWriMo, where one writes a novel in a month, Nathan challenges you to write and play a game in a month! Poppycock! I've seen droves of fearless philanthropists hammer out a playable game in 24 hours. Some of those will view this challenge as a trifle. Each and every reader will have a game they want to play gurgling inside them. It is the voice you can't silence, the thirst you cannot drench, the hunger you cannot satiate. Keeping it bottled up is not doing you any good; release it into the world, you will feel better for it. What better time than doing it with other like minded philanthropist? This November, write a game. Play the game. Tell everyone about it. It's your turn to give something back to the philanthropists. It's your turn to help spread the word of free RPGs. Do it by voting for Old School Hack for best free RPG at the Ennies this year. I believe that the best free RPG award should go to a philanthropist who has created and shared their work for the love of doing so. I do not think it should go to a commercial 'starter ruleset', which is nothing more than a cut-down marketing ploy. With some many superb free RPGs released each year, I think it is tragic that the Ennies rarely manage to have a category brimming with free goodness. The only truly free RPG is Old School Hack, which I am sure you agree is a delightful game* that harks back to the early days of roleplaying but at the same time adds a modern verve to it. Got a blog? Got a website? Do you inhabit forums? Then you can make a difference by going on and on about how Old School Hack is the only truly free RPG in the running and that Kirin deserves it for doing such a good job. Please do use the image above and link it to wherever you like (here, OSH's website, your blog, wherever). If you click on it, it will take you to Picasa where you have options to link to the picture. 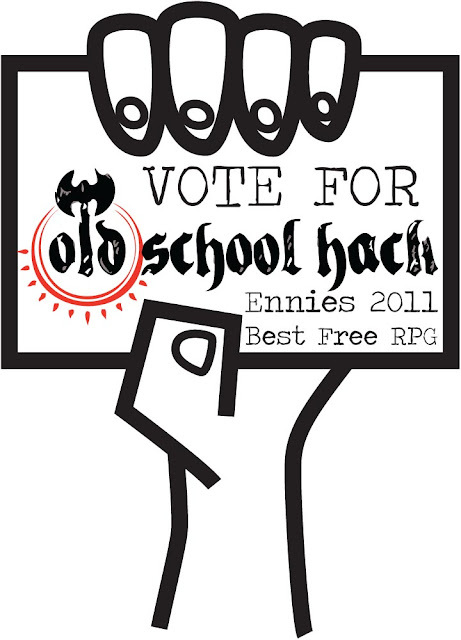 On behalf of the free RPG community, thank you for voting for Old School Hack. We're a niche of a niche but it is wonderful to see one of our number receive global recognition for their hard work and philanthropy. * Layout still troubles me. I've not slept. I know I'm in the tiny minority on that matter. Perhaps even by myself. Few roleplaying games make my brain feel dirty. After reading Nathan Russell's The Droog Family Songbook, a mashup of A Clockwork Orange and The Sound of Music, I will be scraping filth off my consciousness for weeks. Nathan has blended Nuns, Nazi and ultraviolence in a dystopian view of the past. It's such a remarkable slice of head-forgettery that it is difficult to believe anyone could have spawned it in 24 hours. Your character is a member of the Von Droog family. A charming pod of ultraviolent Austrians living in a Nazi infested the mountain range. It's 1995 and the hills are alive with the sound of fascists. Each Droog has three (just a few) favourite things and you are desperate to save them. They could be people, objects or places. You set the look of your character, pick and name and that is all. This is a storygame, after all. The game hinges around creating scenes where each player in turn takes the spotlight to defend their favourite things against the jack boot of the Nazis. It's a night off for your GM because everybody plays. The prime antagonist in any scene is played by the Scene Leader (sort of GM for that scene). Setting scenes and playing through them is well described. This is typical storygame fair and a scene ends in a climax where the player manages to win over the antagonist and either save their favourite thing or see it destroyed/killed/maimed/sent to live in Luton. 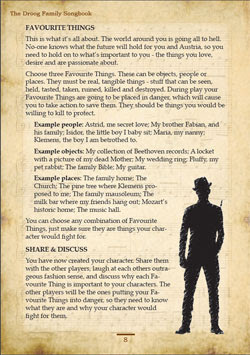 The spotlight player (the Von Droog) can choose leave the scene outcome to fate by rolling dice, winner narrating the ending or to inact ultraviolence to save their favourite thing from harm. Ultraviolence demands that the player describe the horrific and uncomfortable violence in vessel bursting detail. Perhaps more disturbing still is that tied fate rolls lead to singing (or rhyming at least). The closing mechanic that decides how your character ends up after the ordeal is the Denouement Chart. You marry up the number of favourite things you saved and the number of times you used ultraviolence. The more you save with the least Ultraviolence you use the better but there is no winning here, just different kinds of success. Do you end up weak and broken, a violent psychotic or a folk hero? Your choices during the game decides. Droog Family Songbook is attractive to look at, well laid out with good use of language throughout. Nathan has crafted evocative notes from Alex Von Droog that really help bed down the otherwise thin setting. As Nathan points out in his blog, the mechanics are familiar, but I think they are appropriate to the two films, which are blended beautifully. If I were to recommend edits, I'd lighten the background to improve contrast, fatten up the setting and add a silhouette of Alex on the front cover. The singing mechanic could indeed be better but I think that it fits well enough. 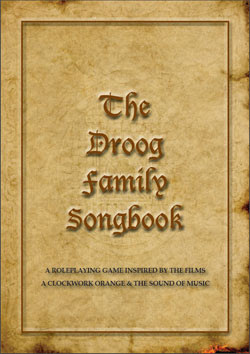 The Droog Family Songbook picks you up, shakes you and kicks you over a garden wall. It blends dark humour and uncomfortable surreality together, which might not be to everyone's taste. Most of all, the game is novel form of cranial fornication which leaves you stunned into wondering what it is like to play. Very few roleplaying games can do that. This one can. Well done, Nathan! The £30 in Amazonness is coming your way. Dave Millar doesn’t roleplay. He doesn’t GM either. He doesn’t tumble D10s. What he does is rock. 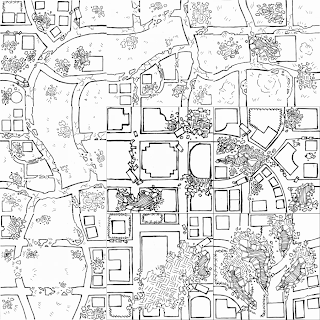 Dave’s Mapper is a free online mapping tool that takes the community Geomorphs and allows you to generate maps, either by random or by semi-random switch and rotate. He has played a huge part in powering the Geomorph movement by providing a breath-taking online tool. Let’s take a look at the superb features bit by bit. You might be baffled as to why a non-roleplayer might want to expend considerable time and effort in a hobby he doesn’t partake in. To understand it, you need to understand the mind of the web developer who does things not just for cash but because they are just too cool to not be done. Dave's mapper is brimming with features that make it not just useful but fun to use. Let's start at the top left and work our way around clockwise. Where possible, I've included shortcut keys in [square brackets]. Clicking New Map will bring about the end of the world. Or at least that's what they want you to think. What it will actually do is create a brand new map randomly selecting from the options (see below). Dave's Blog is a mapper-centric news output that will keep you up to date with developments. Help/About does exactly what it says on the tin. There is a handy key that shows all the common symbols. This is an interesting additional because it helps define a language for new mappers to use to make their own. Supporters are those wonderful people who have donated tiles, ideas, feedback and lunch and Facebook points you at a fan page. You can get there easily by hitting 'Like This' on the top menu. 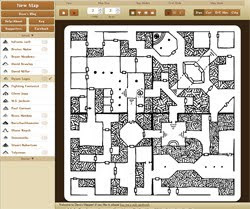 The left hand button on view opens up a PNG version of your map, which you can download to your favourite paint application or upload into Obsidian Portal. The 'Hide Image Menu' button closes the tile menu - which I'll come to on the map section below. As the tiles make up a grid, this specifies the width and height of that grid. The largest map I managed was 50x50 but if you would like the PNG feature, 8x8 is your limit. Edge tiles (that go on the edges and corners to enclose the map) are additional, so if you're using these add 2 onto each dimension. Normal map [shift + n] - Using stock tiles, lined up neatly in a grid and no edge tiles. Stagger map rows [s] - Lines up the tiles so that they are staggered like brickwork. Stagger map rows, show rows end capped [shift - s] - Much more useful than just staggering rows, this one neatens the edges by using end caps. Close off dungeon edges [c] - My favourite, this uses half-size geomorphs to seal the map. Dave has kindly produced a light blue grid that overlays the map. It's handy if you're going to print for miniatures. There are two sizes available: 5m per square or 10m. If you are like me and prefer hand-wavey explanations of distance, you can turn it off. Dungeons. Created by 'intelligent' beings for whom caves are just too disorganised. Dungeons / Caverns mix. Rough hewn edges and purposeful design mashed together. City. A mix of buildings, roads and post-apocalyptic landscapes. Cities don't edge edge tiles. If you click one of the map tiles, you get some choices. From left to right, you can rotate the tile 90 degrees, swap the tile with another, remove the tile and replace with another (randomly) and finally remove the tile and place with an entrance/exit tile. This is an extremely powerful little menu that provides you with loads of control. 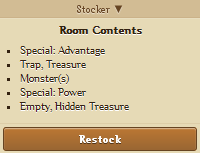 The room stocker is a handy little tool for helping you decide what is in each of the rooms. 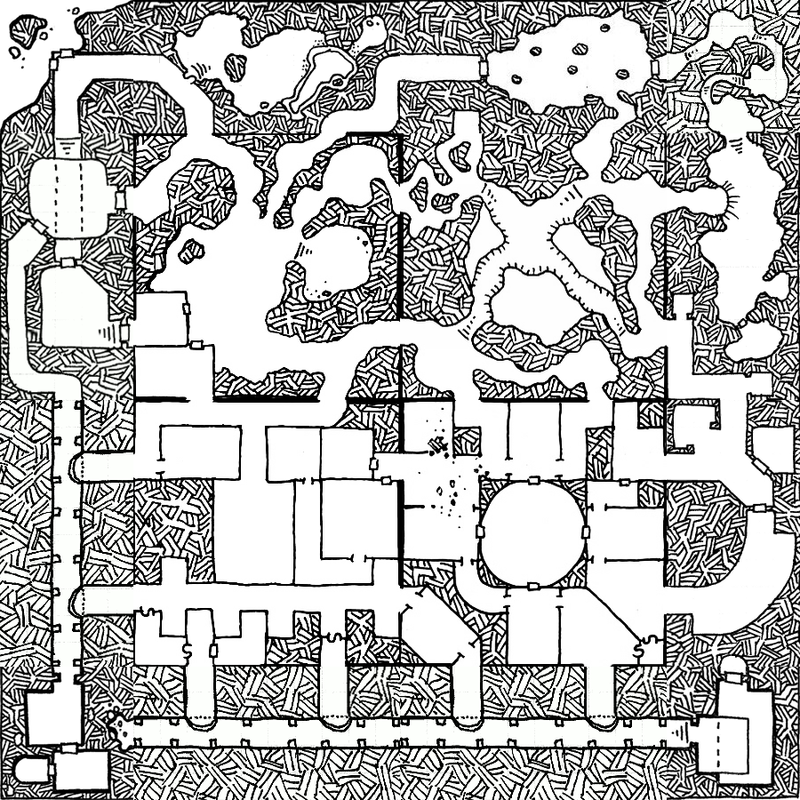 It is most useful in the dungeon/cavern maps and helps the DM who is in something of a rush. Dave would be the first to note that the mapper is nothing without the tiles and on the left hand side you have a list of all the tile sets available. Some look good together, others do not. This is very much a personal preference. Where the mapper comes into its own is in conjunction with your imagination. The random tiles suggest an idea, leaving you to switch tiles, rotate and form your own narrative. 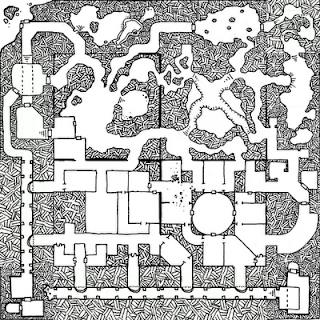 For these two dungeons below, click the image for a larger one. Using tile sets from Dave Millar, Dyson Logos and M.S. Jackson. Size: 2x2, Close off dungeon edges, No grid and Dungeon Cavern Mix. Errol Boltwog never finished anything. He never finished the pontoon under the bridge where he lived happily with his wife. He never finished the hut for the children, nor their tree-house. Not until after they had long left home. His lair - the status symbol of any respected Ogre family - was never finished either. Sure, it had grand plans based around a circular temple to the south east and long colonnades that stretched back and forth. Building the traps just took the fun out of it and he lost interest, abandoning it after years of work. To the north are the dark and dank natural caverns where passers by often shelter from the weather. Many never realise the realise the workmanship that went into the rest of it and the treasure that lies within. Using tile sets from Amanda Michaels and Risus Monkey. Size: 3x3, Normal Map, No grid and City tiles. Inhabited entirely by middle class commuters, Burley-Upon-Pew used to be a lovely little town. Shortly after the event, the delightful little streets became a war ground between them and a hurriedly assembled army of frankly useless warriors. The streets have taken a hell of a battering as the small market town held back against them. Now, some time after the event, this corner of Burley-Upon-Pew is the last surviving outpost of humanity. Dave is still working on new featutres and he has an impressive roadmap of ideas. I've had numerous conversations with Dave about the mapper over the last year and he is the most personable web developer I've met. If you have a tile set or an idea for a feature, he would love you to get in touch. Dave does none of this for cash, instead he asks that you buy him lunch using a paypal link at the bottom. At the very least, let's get blogging about this superb app. Readers! Make a map using the tool and post it here! Now it's your turn. Let's see what delight you can create with the wonderful mapper. There's no prize but let's see what your fevered minds can come up with. Go create!